Yesterday while I was looking at the Blog state I have noticed that some visitors were coming from a certain site called Bing.com. I started to search about it, after some search using Google I found some adds on the net talking about the new Microsoft search engine Bing. 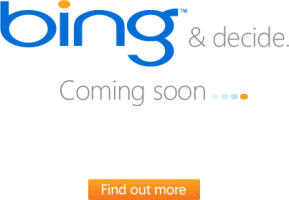 Bing will become available in the next few days and fully be launched by the 3rd of June. Microsoft illustrates that Bing is not a search engine but it is a decision maker by providing a fast preview of search results during a mouseover .people can decide if they want to leave the search page and click on a link, therefore is not intended to be a Google challenger. So let’s get ready for binging!